ALBERT EDWARD JAMES was well known in Camden's Eighth Ward in the 1890s and 1900s as a politician, fireman, and bar owner. 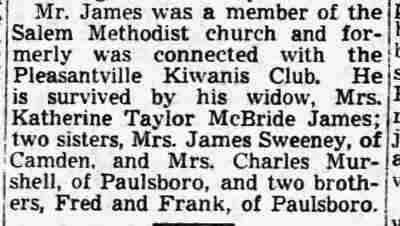 He was the son of William James and his wife, the former Sarah Ann Squires. According to the 1900 Census he was born in September of 1866. His place of birth was a village called Mansfield Woodhouse, in Nottinghamshire, England. His family soon moved to Ruddington, about 23 miles to the south, where brother William James Jr. (1870–1934) was born on February 17, 1870. The family was still in Ruddington the following year when the census was taken. Two more children were born in England, Frederick, around 1873, and Charlotte around 1879.William James emigrated to the United States in 1879, then sent for his wife and children. Mrs. James and her children followed William James to America, arrived in America after Liverpool, England and stopping in Queenstown, Ireland aboard the S.S. British Empire, arriving in Philadelphia on February 14, 1880. Two sons were born to the family in Pennsylvania, most likely in Philadelphia, Frank, in 1882, and Charles James, in 1887, and a daughter, Sadie, born around 1885. The James family came to Camden shortly afterwards, and settled in Camden's Eighth Ward. Edward James Married Katherine Taylor McBride around 1887. It is unclear as of this writing whether they wed in Camden or in Pennsylvania. residing at 555 Van Hook Street. 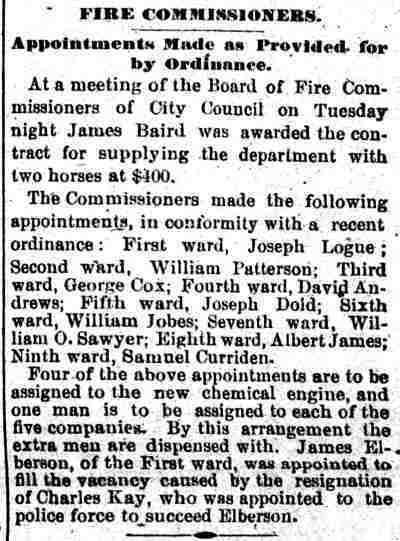 In 1894 he was appointed to the Camden Fire Department. He served with Engine Company 3, 1815 Broadway. 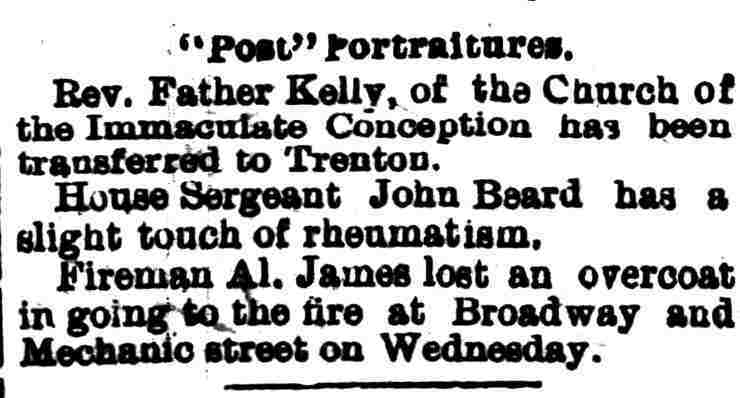 Also in 1894, Albert James' brother William married Ella Fish in 1894, her father Judson K. Fish, was politically active and had served on the Camden Fire Department in the 1880s. 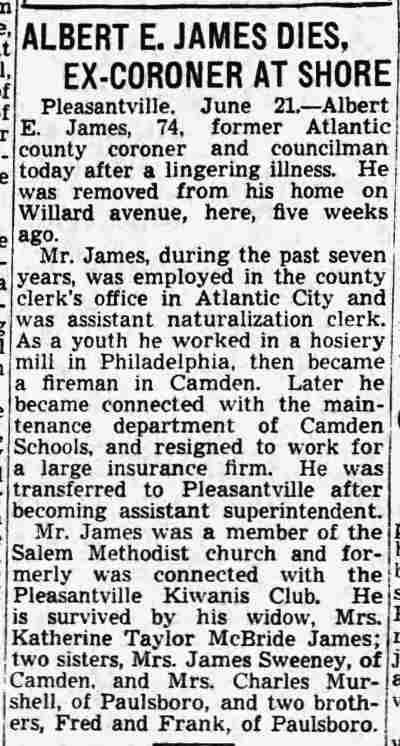 William James soon had a job with Camden's Water Department, where he worked for over 30 years. Newspapers of the day show that Albert James was quite active in social and political affairs in Camden. He would remain so for the rest of his days, long after leaving the city. The 1897 City Directory shows Albert James at 429 Webster Street. Albert James mother, Mrs. Sarah Ann James, died at her home, 1914 Fillmore Street, on August 13, 1897. By 1899 Directories from 1899 through 1903 show Albert and Katherine James at 1711 Broadway. The 1900 Census shows a sister, Sarah (nicknamed Sadie), aged 15, who most likely is the sister of Albert James's wife. 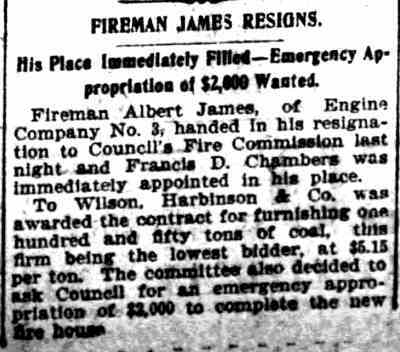 Albert James left the Camden Fire Department in 1900 to take a position as the janitor of the John W. Mickle School at South 6th Street and Van Hook Street. He kept this position until 1905 when he went into the saloon business, acquiring the bar at 1819 Broadway from Martin Ewe. The application to transfer the license to Albert James was filed in June of that year. Sadie James had gone to live with her sister Charlotte at 212 Elm Street but her heart appears to have been in the Eight Ward. On May 8, 1907 she married Charles Murschel, the son of John Murschel, who owned and operated the salon at 2001 Broadway from 1894 to 1916. 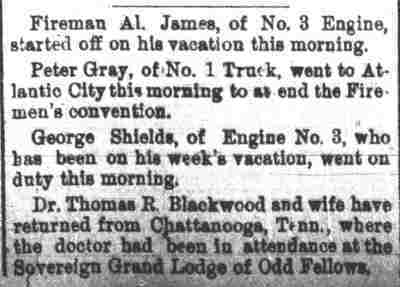 By September of 1909 Albert James had had enough of serving liquor. He took a position as an insurance agent and had moved to Collingswood by the time the 1910 Census was enumerated, living there with his wife and father. At some point during the 1910s he was offered a post in the Atlantic City area, and moved to Pleasantville, New Jersey. The 1920 Census shows that Albert and his wife had moved there, while his father stayed in Camden. Albert James lived out his days in Pleasantville. Always politically active, he was an associate of Enoch "Nucky" Johnson and served as a coroner in Atlantic County for seven years. 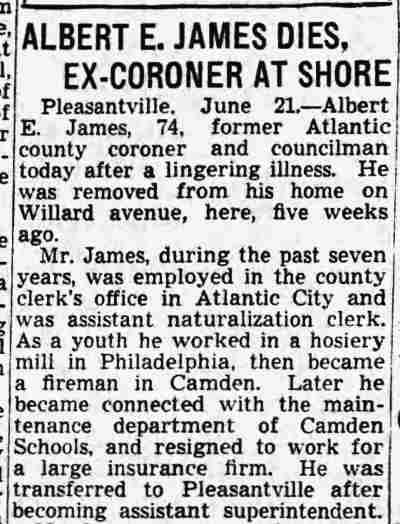 Albert James held a post as a clerk in Atlantic City government from 1933 until his death on June 22, 1940. Albert and Katherine James had no children. His brother William Judson James married Ella Fish, the daughter of Judson K. Fish, who had served with the Camden Fire Department as an extra man in the 1880s. William worked over 30 years in Camden's Water Department. He died in 1934. There, too, was William Dorrell, superjntendent of the old "Narrow Guage" who was one of the leading spirits in the paving of Broadway, nearly 60 years ago the big issue of that section. He lived in a house along the railroad still standing, as the hospital and dispensary of the shipyard.